Want to stand out from your competitors? …. but don’t know where to start? Is marketing something that you feel is out of your comfort zone? How do businesses go about differentiating themselves in a crowded market? It’s simple. Share your story to connect better to your customer and you will build your business. 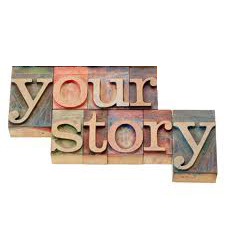 What’s your business story? Can you craft the story of exactly what it is that you do? Can you create your story so that you can connect better with your target market? Psychologists, neuroscientists and more recently marketers have become fascinated with storytelling. Storytelling is a critical skill for business communication. Did you know that 70% of what we learn is through stories? Stories are how we make sense of the world and crucially for business, it is what we remember. Apparently, inside our brains, we have ‘story templates’ ready and waiting to insert the information we receive. If this information is presented in a story format it sticks better. Think of information you take in from presentations, websites and conversations. It’s not the facts that stay with you long term, it’s the stories. Often they aren’t seen as stories, they are sometimes merely situations painted or real life examples that we identify with. Anais Nin said that ‘we see the world not as it is, but how we are’. It’s these emotional brain connections – as marketers, as strategists and business owners – that we try to appeal to when presenting businesses to the market. Marketing is based on the notion that if people really knew what you did, what you are really good at, they would want to buy from you. Marketing isn’t a blunt instrument that paints all customers the same or that sees everyone equally as your potential customer. I hear ‘everyone is my customer’ quite a lot from clients when I first meet them. The logic, I know, is to think you are increasing your chances of sales but in fact you are reducing your likely conversions. You need to be clear about exactly who you are targeting first, then figure out what matters to them. If you don’t know enough, or have a lot of old assumptions, then get out of the office and find out. Get into stores, on the internet, snooping your competitors, questioning your customers. Do some work on it. You need to know this in order to craft your story. In the stories a business tells – be it on a website, promotional leaflet or sales email – customers need to identify with the problem being solved. They need to see themselves as the customer you describe, as the person who needs that exact problem solved. Most business websites set out talking about their services or product features instead of the customer’s problem. They fail to connect and inspire action. They use too much jargon, come across bland or forgettable, or worse sound just like their competitor. When they do talk about themselves they can do it coldly – they think ‘professionally’ – but without any real impact. I’m always trying to get clients to put more of who they are and who their clients are into their communications. OK, you won’t appeal to everyone, but that’s the point. You appeal better to the customer you are trying to attract. The ‘about us’ section is one of the most important pages on a website. It’s one of the most visited pages on a website. You want the prospect to think ‘she’s like me’ or ‘I like that’. ‘That’s my exact problem’ or ‘that business is for me’. This is the connection that inspires action. Story puts a human face on information. Jargon without human connection is forgettable. Story improves the overall comprehension of what it is you do and can simplify complex ideas. Stories are memorable – they help support the retention of the business information and as well as the retelling of it. Effective stories persuade. Good sales people will tell you that people buy on emotion & justify their purchase after on logic. Stories help to sell your business without the hard sell. How can I find the story I need to tell? Your Back Story; How you got started, your eureka moment if you had one. The Passion Story: Why you love what you do. People don’t buy what you do, they buy why you do it. The Personality Story: Your approach to how people might work with you. The Customer Story: Who are your customers? What work have you done for them? How do your customers talk about the help you’ve given them. How to tell your story online? Pain – This states the problem or challenge faced by the target audience. In case of my business for example, it’s businesses who struggle with effective communications, who are overwhelmed by new media and online marketing options, and who are too busy in the day-to-day to work on growing their business. Asperin – is what you do about it, your experience, your way of doing business. Have you a proven ability to transform businesses or problems? Legacy - This is the ‘happy ending’ you create for customers. Why they are ‘better off’ having worked with you. This could be an aspirational future you pain for them. What’s important to note in the PAL approach is that most of it is about the customer, their current and future state. Too many SMEs just talk about themselves! ‘About us’ sections that have ‘soul’. You’re a human being, and so is your customer. The about us is one of the most important and neglected pages on a website. Here’s a nice example of an engaging about us page that draws you in and gives you a real sense of the owner behind the business. Three Thought Bubbles. Videos are so effective in conveying business story in an compelling, memorable, sharable way. Here’s a great example of a UK business doing just that; Mojo Your Business. Customer testimonials in old fashioned text, on LinkedIn or even better video/audio. Hearing your story through your customer is gold. I have some testimonials for how I work here. Case studies or real market examples of what you do are excellent ‘stories’ for business to business. Portfolio pictures, photos, images, Infographics to paint picture that will be remembered. Audio interviews with engaging, relevant content. Audio podcasts are making a comeback! It puts the human side of your business across in a way that stands out. Here’s a Galway accountancy business called Bradan Consulting using audioboo to tell it’s story in 2 minutes. This was crafted, recorded and edited by Weave a Story. I also plan to run a series of Marketing over Coffee podcasts to bring my blogs to life and am in the process of recording these. Online slideshows, presentations can add to your story better than just text … especially if you are on a budget. PR – local and national news – stories shared online and in traditional media can reach big audiences. Customer generated content – It’s much more powerful to hear about how you rate or work from your customers. Ratings were Airbnb’s strongest card to instil trust. Do you have recommendations on your business or customer testimonials? I share my endorsements here in ‘How I work’. Endorsements on Linked In, feedback, comments, retweets all help spread your story to new audiences. Guerilla marketing is any marketing communications that is unexpected or out of the ordinary. This can be low cost and very effective. For example a dance school doing a flash mob to launch a new product. These are just some ideas for online business storytelling. Even if you take just one idea and try to activate it. Telling your business story well is such an effective marketing tool. It helps you stand out in a crowded marketplace. It’s all about human connection. It doesn’t have to be expensive, but it should always be inspiring. Share your story. Connect better with your customer. Build your business.